About: Located in Landsdowne House, Babble is a night club with a late license (on Fridays and Saturdays) that consists of 2 floors playing some of the latest tunes. They also have a bar and restaurant area serving a variety of cocktails, tapas style dishes and vegetarian dishes. Booths are also available and Happy Hour is from 5pm until 7pm. If it’s a glitzy West End soiree you’re after, Babble is just the ticket. There’s comfort food, a wide selection of Champagne and cocktails, and the staff can help you plan your party. If you’re lucky you might even spot the odd celeb. 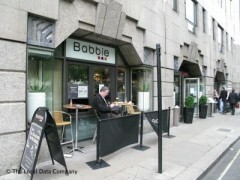 A sister venue, Babble City, recently opened near Liverpool Street. Another chain bar. Nothing memorable. Beer was cold, staff were friendly. So a 6! I went to Babble for a birthday party 2 weeks ago on a saturday night and we all had a good time. We had reserved a semi-private booth for the occasion. The service was quick and friendly and the atmosphere and vibe in the club were really good but without any pretention. This place was never very good but I gave it another try following its refurbishment. The bar was empty and it took 25 minutes to try and get served (we subsequently gave up). Simply not worth the effort.